Group Similar Listings and “Our Pick” are the next phase of eBay’s evolution. But how did we get here and what does this mean for sellers? This post is by Cardy Chung. Cardy is the founder of StreetPricer, a dynamic repricing, competitor analysis and price monitoring tool for serious eBay sellers. Big changes are in progress at eBay, but to understand how we got here, we first have to look at Amazon. On Amazon, the Buy Box is a crucial part of the marketplace. Buyers search for a product, view the listing and the Buy Box chooses for them which of the sellers offering that product is the best. This is all underpinned by Amazon’s catalog-driven approach which makes browsing products easier, as there should be only one listing for each product. eBay is a very different marketplace. It takes a listing-driven approach, that means while sellers compete in search, they each have their own independent listing for every one of the products that they sell. This is now starting to change, as eBay has rolled out a new feature called Group Similar Listings, which comes with their own version of the Buy Box. Group Similar Listings is not yet a default setting, but by clicking a button, the search results are grouped so that all listings for the same product are put together under one single search result and product page. 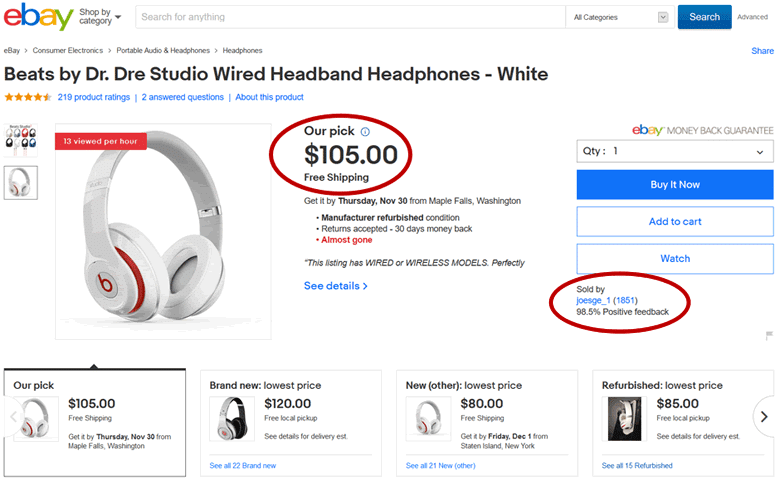 eBay’s version of the Buy Box, called “Our Pick”, chooses which seller will get the order when Buy It Now is clicked, based on which one the algorithm deems to be best. In this post, I’ll be looking at why eBay has decided to introduce Group Similar Listings, how it works, and what it means for eBay sellers. Over the last couple of years, eBay has been making a lot of noise about structured data. The aim is for more and more listings to include product identifiers (GTINs, UPCs etc), item specifics and other data attributes. This isn’t eBay’s first step towards making their listing database more structured and easier to browse. The process can actually be traced back to the introduction of item specifics over ten years ago. This gave sellers data fields to add information like size, colour, brand and product features and has been expanded more and more over the years. Throughout, the goal has always been the same – to help buyers find the right item. Whether it’s using item specifics to filter down search results, or using product identifiers to add standard catalog descriptions to movie and music listings. This admirable goal is now moving into the next step of its evolution, grouping listings for the same product together in a very similar way to Amazon’s product detail pages. It’s essentially eBay’s own version of the way Amazon has worked from the very start. Why did eBay introduce Group Similar Listings? No matter what you think about Amazon, there is no getting away from the fact that their philosophy has been very successful. Over the last decade, Amazon has experienced exponential growth in comparison to their competitors because consumers, on the whole, love using their marketplace. Their catalog-driven approach and the Buy Box have played a big part in this, as both features have made it easy for consumers to find the right deal very quickly. They don’t have to browse multiple listings that offer the exact same product, and there’s hardly any time-consuming choices to make because the Buy Box has already chosen the offering that they think is best. In fact, it’s estimated that 82% of purchases on Amazon are completed through the Buy Box, showing the level of trust that consumers have in the choices it makes. With this in mind, eBay knew that to regain market share and please its customers, it needed to roll out its very own Buy Box. This is not only because it has proved very successful in driving sales, but because it’s the way that customers want to buy commodity products online. How does Group Similar Listings look to buyers? To understand how Group Similar Listings works, and to see the effect that it has on search results, it is important to look at it from a buyer’s perspective. The first thing to remember is that Group Similar Listings is not currently a default setting. So, if you’re looking for a pair of headphones and search “beats headphones”, the results will look no different at first. The Group Similar Listings button is situated at the top right of the search results. 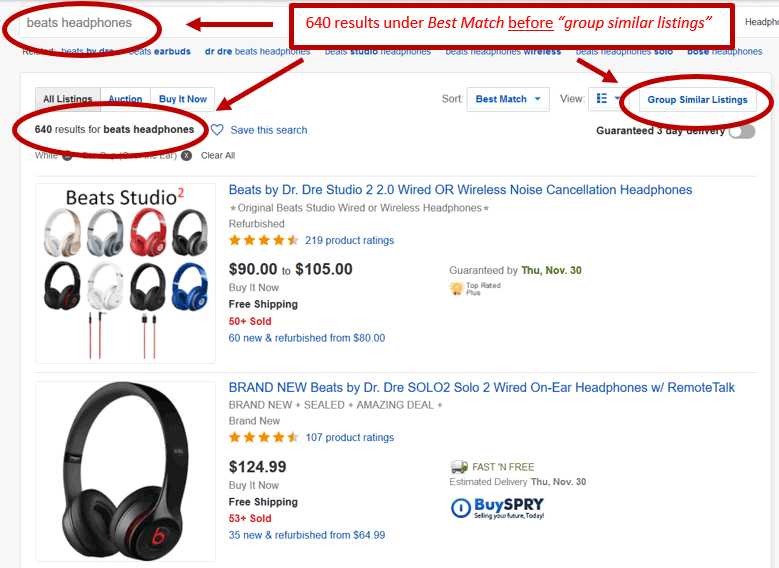 When the buyer clicks it, all the listings offering the same headphones are grouped together as one. This really reduces the number of search results, in this case from 640 down to just 38. After the listings have been grouped together, you can see eBay’s “Our Pick” and then over to the right you can see the number of other buying options available and the lowest-priced products for different item conditions. When you click on the listing, you may be surprised to find out that it isn’t always the lowest-priced product that eBay picks. It also doesn’t always choose a new product – we’ve seen it favor used, refurbished or pre-owned products even when a new product is available. It seems that in a similar way to Amazon’s Buy Box, “Our Pick” takes feedback into account, as we’ve also seen big retailers with huge amounts of feedback win Our Pick over smaller sellers despite having a far higher price. If buyers aren’t happy with eBay’s choice, underneath the Buy Box are other buying suggestions. In the example above, the main item is manufacturer refurbished, and eBay is also showing the lowest price for a brand new product, a “New (other)” product and an ordinary refurbished product. The item conditions shown here vary depending on the product searched for, and can sometimes be scrolled horizontally to include a wide range. How does it affect you as an eBay seller? The impact that Group Similar Listings will have on you depends largely on whether or not you include GTINs in your listings. While eBay has made Brand, MPN and UPC compulsory across almost all categories, you do have the choice to enter “Does not apply”, or as some sellers do, just make up a random value for the GTIN field. The main impact of Group Similar Listings is going to be increased price competition. If you choose not to include a GTIN, then you won’t be seen at all under Group Similar Listings. This means that you won’t have a chance to make a sale if a buyer decides to use this feature. But there are some good reasons why you might want to avoid having buyers see your listing when they use this feature. It could be that you don’t want to be compared to other sellers because your product has subtle, but important, differences, such as bundled accessories or personalization, and you need buyers to read your description in order to be aware of this. Equally, you may be worried that eBay will incorrectly group your listing and land you with an “item not as described” claim. However, Group Similar Listings could become the default search option on eBay. So, for sellers offering commodities, it is perhaps better to get with the program now, familiarize yourself with how the algorithm works, and be ready to compete if and when it is made a default setting. So what’s the impact for sellers who are including GTINs? Well, the main impact of Group Similar Listings is going to be increased price competition. While price is not the only factor in winning eBay’s Buy Box, it is clearly one of the most important. In any case the listings with the lowest prices are highlighted below eBay’s pick, so it is made easy for the buyer to find the best price even when it doesn’t win the Buy Box. 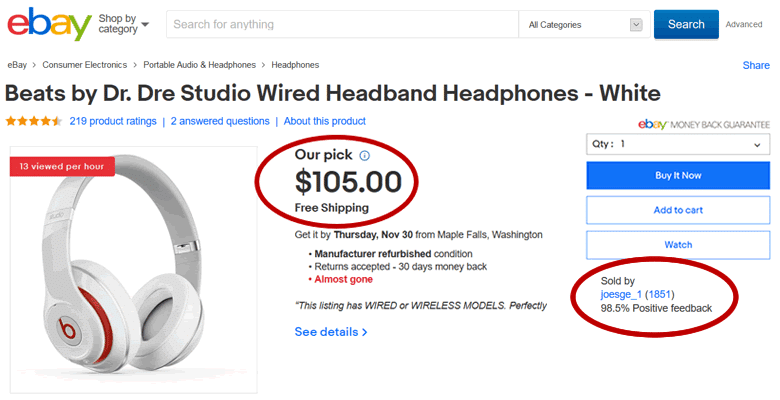 Increased price competition is going to mean that eBay sellers will reprice their products more often, and more will look for tools to help them do this. To date, eBay repricing tools haven’t been in mainstream use, and many sellers will never have thought about using one with eBay. The use of repricers is going to become much more common for eBay sellers. This is in contrast to Amazon, where successful sellers offering competitive products will almost certainly be using a repricer. 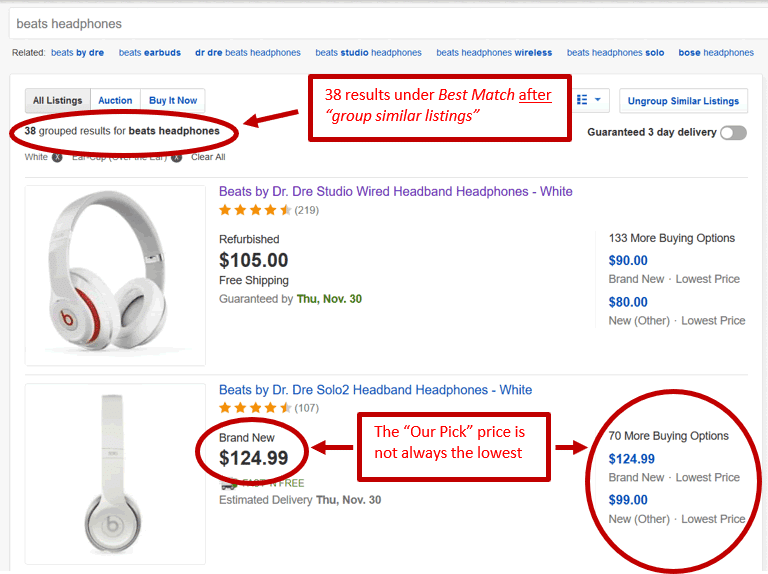 On Amazon, repricers identify your competition and adjust your prices depending on pre-set rules, or strategies, to get your product to win the Buy Box more often and therefore sell more. This may mean having the lowest price on highly competitive listings, but using more subtle strategies on less competitive ones. The use of repricers is going to become much more common for eBay sellers, because Group Similar Listings means that more sales will go to the seller with the lowest price, either through Our Pick or the lowest-price suggestions below. eBay sellers will still want sales, even at a lower margin, and an automatic repricer is likely to be an important part of that strategy. A final thought is that eBay sellers that can’t, or won’t, compete directly on price will look to differentiate themselves in other ways. This could be by selling their own private label branded products, bundles, multi-packs and more. By differentiating their listing, they may not get seen as often but they will avoid competing head-on and help protect their profit margins. Private labeling has run riot on Amazon, as sellers battle to “own” their listings rather than compete with others for the Buy Box. Perhaps we may see some of those seasoned Amazon private labelers trying their hand on eBay, once they have seen Group Similar Listings and Our Pick. The introduction of Group Similar Listings and Our Pick marks a big move away from eBay’s history as a listing-driven marketplace. And, if it becomes a default setting, this shift will become complete. In many ways, eBay rolling out a Buy Box makes sense. Amazon has used this model to great success, and it is clearly how buyers like to purchase products online. It also doesn’t come as too much of a surprise, as eBay has been heading in this direction for a number of years. eBay sellers will now undoubtedly face new challenges and stiffer competition than ever before. It will almost certainly drive prices down on commodity products, and sellers will have to compete on price, differentiate their products, or risk being driven off the marketplace. This post was by Cardy Chung. Cardy founded StreetPricer in 2016 after 13 years in online retailing and developing software for exclusive use in his eBay and online business. Prior to online retailing, Cardy was an executive in the IT industry and Board Member of a publicly listed technology company in Australia. He holds a B.Sc. (Hons) Computer Science (1st Class) with a major in Artificial Intelligence. Thanks for the article Cardy, a really good overview. Will certainly be interesting to see how this effects eBay’s overall sales figures and the breakdown between different sellers. My feeling is that those that are experienced in online retail in general and open to change and adaption may thrive Whereas long term eBay only sellers with little experience outside the ebay sphere may really struggle. In the end though, change will be driven by what buyers want not sellers, it will be interesting to see if eBay buyers embrace this change or not. Yes agreed – it’s the buyers who have the money and they will decide where and who they spend the money with. The internet is empowering them and they are smart. The market is price driven. Thanks for this very insightful article. Just like repricers it is going to trigger the research for private labelling suppliers and manufacturers. That’s a really valid point. Private Labelling strategy is a research topic in its own right. It has a totally risk-return profile. For those sellers who are in it for the long haul, who have the product expertise and willing to invest, it can work very well.